“Innovation is the key to success”. This has well been proven by Procurement and Supply Chain Academy, which has in little time established itself as a trusted training institution for corporate learners. Our academy is committed towards excellence and quality delivery through our rigorous training and development resources, offered to our highly esteemed customers. Over a few years, our team grew stronger and currently accounts for more than 150 Blue Chip companies. To confirm our global presence, the IFPSM global standard was attributed to us in 2015 and we are thankful for that priceless recognition. 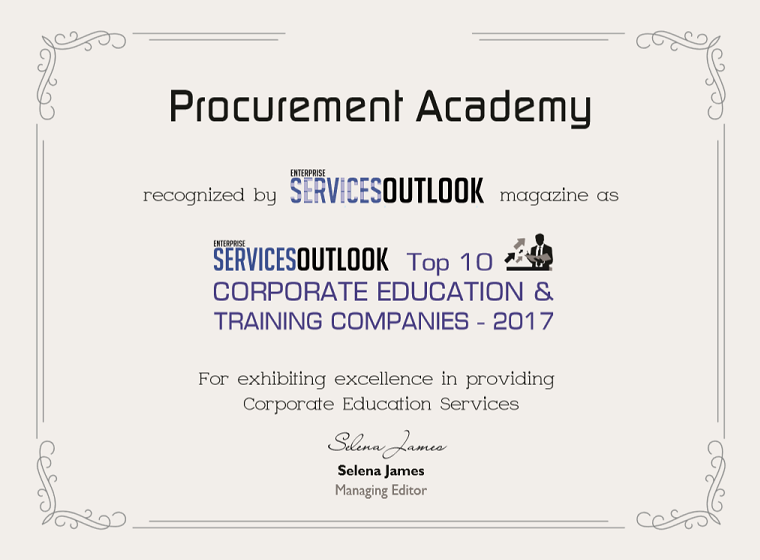 With innovation acting as a catalyst in the delivery of competence development for major corporations, Procurement and Supply Chain academy has been listed in the ‘Top 10 Corporate Education and Training Companies for 2017’ by ES Outlook, a leading magazine in the domain of enterprise services. Procurement & Supply Chain Academy. We are truly honored by this industry accreditation. This is an appreciated reward, attesting our continuous dedication to providing world class competence development for global corporations. ES Outlook; Enterprises Services Outlook is a corporate magazine providing a platform to thinkers, practitioners, strategists and visionaries in the enterprise services. Basically this enterprise promotes talent of performing companies existing on the market or those who are new but equally competent. Acting as a repertoire of innovative offerings from service providers, ES Outlook helps them to showcase their abilities and resources. The enterprise is an in-depth information provider, that is, it allows companies to share their practical experiences on one platform. Procurement Academy is proud to be associated with ES Outlook and looks forward to collaborating further in the future. We want to seize this opportunity to extend our warm gratitude to our great customers and ardent online readers. We dedicate this award to our valued customers who have shown continued interest in our training and development solutions. At Procurement and Supply Chain Academy, we aim for the highest quality program. As such, this new award, re-affirms our commitment to providing global training excellence. We value the trust you instilled in us which has helped us to be ranked among the TOP 10 Corporate Education and Training Companies.